Western box elder bugs, while not as widespread as other nuisance pests in the Pacific Northwest, can be a seasonally acute problem on and in structures. These black and red bugs tend to congregate in large numbers on the sunny side of homes during the late winter or mid-autumn seasons. If populations are large enough, box elder bugs can get into a home, making a nuisance of themselves in flying around and in defecating on wall surfaces and other resting places. During the summer months, box elder bugs are less problematic on structures. They will typically feed on the leaves and seeds of several species of maple trees. When the trees lose their leaves and seeds, the box elder bugs will seek out warm, sun-exposed areas to group together (coupled with daytime air temperatures between 45-65° F.). Away from structures, such locations may include sun-exposed rocks or layered tree bark from mature trees. Exterior siding, shake roofs, and exterior door and window jambs are favorite locations to congregate on buildings. In extreme cases, they can attempt to winter over in sheltered areas of a building, such as roof eaves, door and window casings, or in wall voids. Corrective measures: Ideally, control of box elder bugs should focus on the host trees where they spend the summer to live. Unfortunately, these host trees may be located off-site from one’s own property. In such cases, focus may be need to be directed toward a combination of physical exclusion to keep bugs out of the structure’s interior and application of repellent products to greatly reduce the risk of box elder bugs congregating on structures. 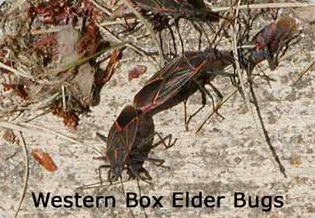 In western Oregon, box elder bugs can be a particular nuisance problem in some areas. In recent years, restrictions have been placed on the application of some EPA-registered products that in the past provided a measure of repellency of these pests on structures. Leupitz Pest Control can provide suggestions on homeowner options to control these unwanted pests.